This swap will be apart of an International Spring series. For this swap you will be sending two partners two seed packets each. If you would like to send more, go head ! These will be store-bought seed packets. Make sure to add your Swap-Bot name and the Swap Name to your envelope. If you have any questions or concerns feel free to comment or message me :) Happy Swapping ! These have to be flower seeds? Not veggies? Just a word of warning to double check your countries import regulations for plant seeds when signing up for the swap as a lot of countries specifically ban seeds in the mail unless they are properly declared with a special import form attached. 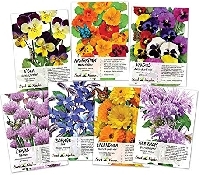 Most countries do not allow flower seeds or veggie seeds through customs. Most of these seeds will get destroyed.